If you’ve read about my intentions to “Go Green” in The Challenge, you’ll see I’m committed to making my travels as eco friendly as possible. Yes I’ll be burning through the ozone as I fly between destinations but as soon as I hit the ground I’ll be unzipping my bag and riding off on an ultra light folding bike. 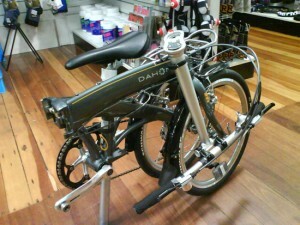 That’s the plan anyway, so I’m on the search for a suitable set of wheels to take with me and today I test rode a Dahon Mu SL. Thanks to an aluminium frame, the super light Mu SL weighs in at only 8.7 kgs (19.4lbs). With fold up dimensions of 36 x 64 x 81 cm (14″ x 25″ x 32″) that’s small and light enough to pack in with my clothes and still be under the airline luggage limit! Some will say it looks a little clown-ish but the bike rode surprisingly well, is comfortable, speedy and has some decent running gear. It’ll be perfect for getting to and from yoga and cruising the streets while I’m away. 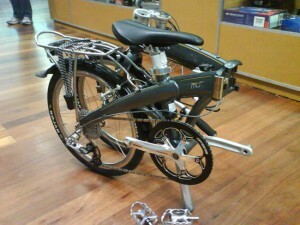 When folded, it’s small enough to take on a bus or train for longer commutes. The bikes only look odd…and the more there are, the less odd that will be 😀 Go, go, go! Hey thanks for the support xiousgeonnz! You def have a new-old fan in Germany! Gurunick, what a great suggestion! I was actually thinking of tattooing my body with the petals of a lotus leaf but Bikram didn’t appear that happy with the yogis that were sporting tattoos at the Bikram Seminar in Sydney this year. Oh and it is a tigress print I wear as the tiger print unfortunately didn’t come in fluro. Cool! Is there only one studio in Germany? Is Berlin the only one? Well, there’s a small chance that I’ll be working there. MAYBE…I’ll know more in December! 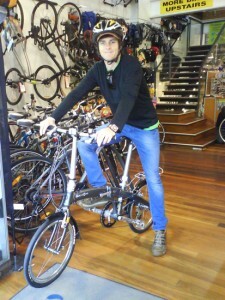 It’s A$1100 at Bike Depot Sydney. It’s an online store, but they have a shop in Enmore. Been there, good service. Googleable. Hi yogi Matt, look forward to seeing you in Malmø!